GlobalWay BestComfort Luggage Set has three sturdy and durable, lightweight, hardshell suitcases of 20, 24 and 28 inches with spinner wheels and TSA approved locks. The set can be purchased in black, grey, sky blue, wine red and silver, with slightly different patterns and the price differences you may see on the Amazon product page. The interior is fully lined (210 D polyester lining) and includes the cross straps with a buckle on the right hand side and a large mesh zipped pocket on the left. These will help keep your belongings stay put in place when you open or close the bags and not move around during your air travel. The exteriors are made of sturdy ABS plastic that is lightweight and are resistant to scratches. They do not have much extra weight other than the light handles and the wheels and you shall be able to pack more. You won’t end up paying anything extra for going over the weight limit. The locks are TSA- approved on the 24” and 28” suitcases, which means the staff of TSA at the airport can open and inspect your suitcases with no damage caused. Just follow the easy instructions to reset the three-digit combination lock. There is an ergonomically designed aluminum alloy push-button telescoping handle that you can lock at three points and the 360-degree rotating spinner wheels and balanced edge on foot. The wheels slide nicely and the bags are very easy to maneuver and to pull behind you and push in front of you. There are soft and comfy, stable and supportive handles on both the sides and the tops. They are all waterproof so you don’t need to worry about the rain. The smallest cabin luggage weighs 6 pounds and measures 15 x 9 x 23 inches including the wheels and the handles. The 24” suitcase weighs 7.5 pounds and has the measurements of 18 x 10.5 x 26 inches and needs to be checked in prior to your flight. The largest 28” suitcase weighs 9.5 pounds and measures 20 x 11.5 x 30.5 inches and will also have to be checked in. Please note that the lock on the 20” bag is not TSA approved, which is probably not necessary considering that it will mostly be used as a cabin bag that you’ll take to the plane with you. 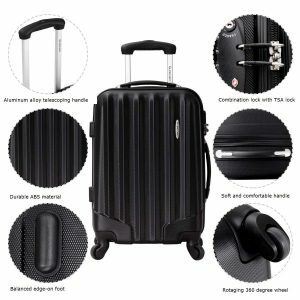 BestComfort Luggage Set seems to be a great deal overall, with the sturdy construction, ergonomic design and user-friendly features like the TSA combo locks, smooth spinner wheels, solid handles and more. The bags are claimed to be reliable and offered at a very low price. They are shipped within just a couple of days via Amazon.com for you to get them delivered to your address within only five days. The set is offered with a hundred percent money back guarantee along with a very decent customer support. And we will see by time how durable they will prove to be. The rating is 4.9 out of 5 stars by 9 customers on the day of this review.